11" x 8.5" x 0.15"
12" x 12" x 3.25"
3.75" x 3" x 3"
33.25" x 4.15" x 0.15"
4.75" x 2.25" x 0.125"
6.2" x 9" x 2.7"
6.5" x 6.5" x 0.1"
6" x 1" x 0.1"
9" x 9" x 0.65"
Create a one-of-a-kind wedding shower with DIY everything. Wedding showers used to be for bride and bridesmaids only, with traditional bridal shower party supplies that could have come straight from a bridal shower decoration kit. Not anymore! Now it’s perfectly acceptable to invite everyone in the wedding party — plus friends and family from both sides — and DIY all the wedding shower details. No matter who’s hosting or who’s on the guest list, find DIY wedding shower supplies — invitations, flower arrangements, favors and way more — at Michaels. 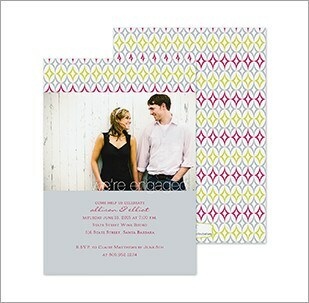 We also have a few wedding shower tips to get the party started. The good news is any time of day is perfect for a wedding shower. A casual lunch, a cocktail buffet, a dynamic dinner party — any of those works as long as you’re into it! Food can be light bites or a full-on party spread. 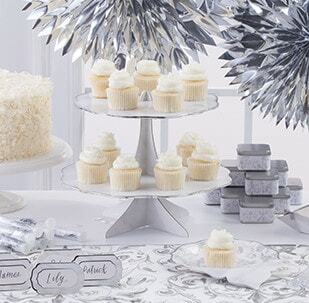 Wedding shower plates and tableware help pull the theme together. If the wedding shower is happening at a home, dress up the living room or patio with wedding shower decorations such as string lights, flowers, garlands or candles. Personalized chalkboard signs are having a moment, and balloons in the shape of a heart or the bride and groom’s initials are fun accents. 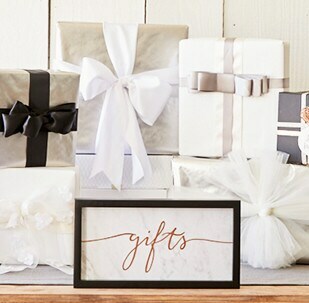 Of course, you need to make room for a wedding shower gift table for guests to drop off presents! Traditional wedding shower games are way more fun at a couples shower. Ask partygoers to write down their (funny or serious) wedding advice. Or gather pictures of the bride and groom throughout the years, and see who can guess how old they were when the photos were taken. Whoever gets closest wins a prize! Because everyone loves a treat, set up a candy station with glass jars stuffed with sweets in your wedding colors. The candy jars can do double duty as wedding shower favors, or you could opt for trinkets such as bottle stoppers or wine charms if you want to send your guests home with a little something. One more piece of advice: Sign up for Wedding Rewards to get exclusive savings on all the things to DIY your wedding shower.